Click the button below to add the Sinar Pan Tilt Tripod Head to your wish list. This is a very clean Sinar Pan-and-Tilt Tripod Head. With it's black powder-coated finish and chrome accents, this head would be contemporary with the Sinar P Series cameras, introduced in 1970. The dedicated head features the standard European 3/8” mounting thread and two (2) positioning posts that help align the camera's rail clamp quickly when mounting. This low profile, sturdy tripod head will accommodate Sinar Norma, Sinar P and P2, Sinar F and F2 4x5 inch, 5x7 inch and 8x10 inch cameras. It is in perfect working condition, and cosmetically only shows minor signs of use. The rigid pan-and-tilt head—with two-stage locking. Half locked, it permits smooth adjustment of your SINAR or other camera to adjust the field of view without tilting. Adjustment range: Rotation through 360°, tilts back 20°, forward 180°. 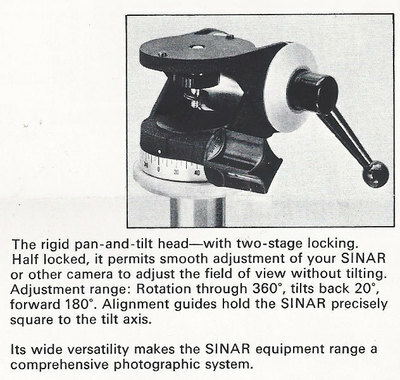 Alignment guides hold the SINAR precisely square to the tilt axis. Its wide versatility makes the SINAR equipment range a comprehensive photographic system.